Senix: Farming can often be a business of high-risk, low profit margins, and lots of debt. Researchers are now experimenting with high-throughput automated plant phenotyping, a technology that reduces the risks and increases the profits of farming. Part of that technology is ToughSonic ultrasonic distance sensors from Senix Corporation. 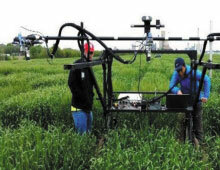 The Biological Systems Engineering group at the University of Nebraska in Lincoln used Senix ToughSonic sensors, along with other types of sensors, to determine whether automated non-contact measurements of crops early in the growing season would relate to end-of-season crop yields. In the 2015 growing season, tests were initially done on both soybean and wheat fields using Senix ToughSonic sensors to measure crop canopy height (how tall the plants were). Other sensors were used to measure the “Normalized Difference Vegetation Index”, temperature, reflectance and RGB color. In summary, strong and significant correlations were observed between various types of non-contact sensor data taken early in the growing season and the eventual crop yields at the end of the season. According to research team member, Assistant Professor Yufeng Ge, “The Senix sensor works well for us and I found it robust and reliable for the plant height measurements in our applications.” Professor Ge says similar research continued in 2016 and 2017 and will continue for the next few years, expanding to include corn, sorghum and camelina. Agricultural equipment manufacturers are now talking about using Senix ToughSonic sensors to measure crop canopy in real-time while rolling through the fields. “Precision agriculture” applies the right amount of fertilizer and water to small individual sections of a field, in some cases down to individual plants, based on real-time crop measurements. Senix is proud to be a part of this agricultural technology, reducing risks and increasing profits for farmers.